this is a very funny photo…i always thought i would be better off fully covered up on the beach. but like you said the lack of support is something i didn’t realize…it would be hard to think of ever wanting to put on those swinsuits. What a wonderful picture. Great grief..can you imagine wearing one of those suits?? Back in the day though, they were right in style, but I agree about the support. oh.my.goodness! what a hoot! and with that i will refrain from further comments! What a great picture! I would think it is from the 20′s. It’s fun to see people having such a fun time. Teresa~~ Gosh, such immodesty. REALLY !! What is the world coming to? I love old photos and like you I wish I knew more about the event and the people. Ah, the days before Spandex! You are SO right about the need for a little support. Makes me feel a bit better about my girls and their gravitational victimization. Yes, a little help/support…yikes! ’nuff said! Wouldn’t it be fascinating to know the story behind that photo…makes you wonder, doesn’t it. These remind me of the swimsuits we had to wear in junior high, cotton tank suits that reveals every bump and curve. Yikes! They need some foundation garments sewed in. hahahahaha how FUNNY..they certainly were game! !..you wouldn’t get me into one of those cossies that’s for sure LOL!!! I wonder about the story behind pictures too. Its sad the stories get lost but Im always glad when the pictures dont …so many times they do! Oh my gosh… I’m still laughing. Your comment about men needing full coverage is a great. Thanks for the laugh. What a great picture, and I would also love to know the story behind it! It was probably a very hot day, so the whole extended family decided to take a dip in the swimming hole! That picture is a hoot! It makes me think of summer and lazy hazy days…. Thanks for sharing the great swimsuit picture. You’re right…the support was not there. I wonder if they took off those stocking things to swim? Great photo, Teresa. I am feeling grateful that we have improved the support offered in women’s bathing suits!! EUUUUUWWWWW! Scary, teresa! I won’t be caught in a swimsuit anymore my SS skin is not to be seen but covered up! Holy crap they really do need some support don’t they. Hilarious! Now that is a picture ‘Worth 1000 Words’. Aren’t we grateful for Spandex? The lady in the dress is saying, “Honey, aren’t ya going to take off those socks before going for a dip”? That’ll get the story ball rollin! 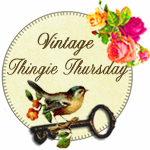 This is my first VTT and I’ve really enjoyed all the wonderful Vintage Posts. Yours has been really fun. I hope you’ll stop and see my Head Vases. They were sort of a water thingy at one time too. What a hoot!! I agree…not much to look at on a beach back then…LOL Great vintage photo to share today, thank you for the laugh. Happy VTT! You are on exactly the same wavelength as me … the first thing I thought was the ladies could do with a little more support … maybe a corset under all that nasty wool! LOL Wow, things have changed so much and comfort is one of those things I’m sure glad we have more of in clothing. Nice posts. yeah, it kind of makes you appreciate a simple shelf bra!